We have a FREE Advance Screening of “Isn’t It Romantic,” and we want YOU to go! All you have to do is click on the link below to follow us on Facebook or Tweet this page, and then COLLECT YOUR PASSES!!! Passes, as well as seats at the theater, are FIRST COME FIRST SERVED! So act fast and arrive early! 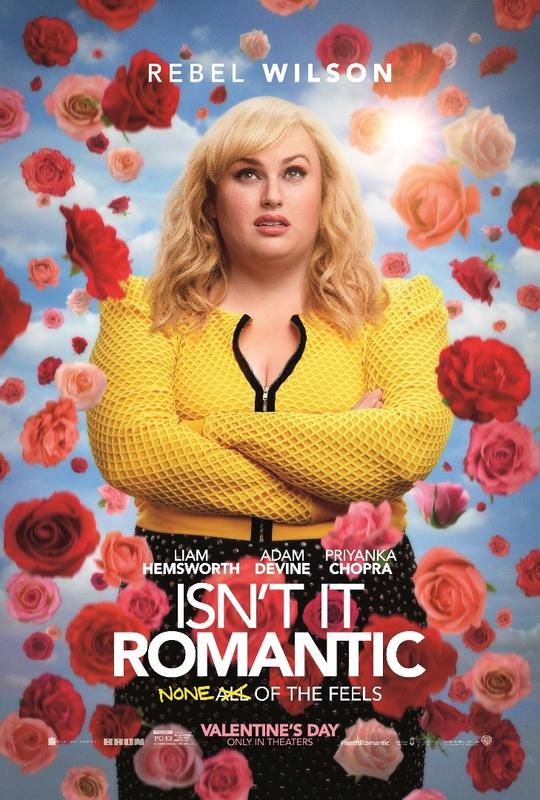 From New Line Cinema comes the romantic comedy “Isn’t It Romantic,” starring Rebel Wilson (“How to Be Single,” the “Pitch Perfect” films), Liam Hemsworth (the “Hunger Games” films), Adam Devine (“The Intern,” the “Pitch Perfect” films) and Priyanka Chopra (“Quantico,” “Baywatch”), under the direction of Todd Strauss-Schulson (“A Very Harold & Kumar 3D Christmas,” “The Final Girls”). Wilson stars as Natalie, alongside Hemsworth as Blake, a handsome client; Devine as her co-worker and earnest best friend, Josh; and Chopra as Isabella, a model and self-proclaimed yoga ambassador. Strauss-Schulson directed from a screenplay by Erin Cardillo and Dana Fox & Katie Silberman, story by Erin Cardillo. Gina Matthews (“13 Going on 30,” “What Women Want”), Grant Scharbo (“13 Going on 30,” “What Women Want”), and Todd Garner (“Paul Blart: Mall Cop,” “Tag”) are the producers, with Richard Brener, Dave Neustadter, Andrea Johnston, Marty P. Ewing, Rebel Wilson, Aaron L. Gilbert and Jason Cloth executive producing. Collaborating with Strauss-Schulson behind the scenes are director of photography Simon Duggan (“The Great Gatsby,” “Hacksaw Ridge”), production designer Sharon Seymour (“Argo,” “The Town”), editor Andrew Marcus (“Begin Again,” “Sing Street”), and costume designer Leah Katznelson (“How to Be Single,” “Sleeping with Other People”). New Line Cinema presents, in association with BRON Creative, a Broken Road/Little Engine Production, “Isn’t It Romantic.” Slated for release on February 13, 2019, the film will be distributed domestically by Warner Bros. Pictures. The film has been rated PG-13 for language, some sexual material and a brief drug reference. I would love to have two passes to see this movie. No link to to passed for Tampa. I so want to see this movie with my friend!